Performance Preview - Straight-Talk. Accountability. Results. This website is best viewed by browsers rendering Flash content. The performance review. It is one of the most insidious, most damaging, and yet most ubiquitous of corporate activities. We all hate it. And yet nobody does anything about it. 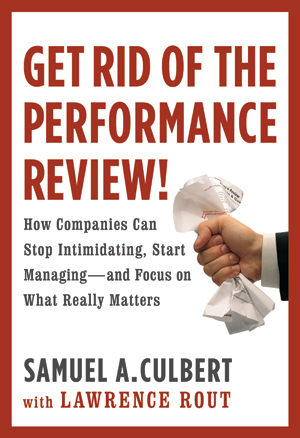 Straight-talking Sam Culbert, management guru and UCLA professor, minces no words as he puts managers on notice that -- with the performance review as their weapon of choice -- they have built a corporate culture based on intimidation and fear. Teaming up with Wall Street Journal Senior Editor Lawrence Rout, he shows us why performance reviews are bogus and how they undermine both creativity and productivity. 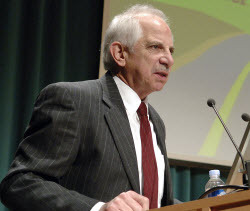 And he puts a good deal of the blame squarely on human resources professionals, who perpetuate the very practice that they should be trying to eliminate. But Culbert does more than merely tear down. He also offers a substitute -- the performance preview -- that will actually accomplish the tasks that performance reviews were supposed to, but never will: holding people accountable for their actions and their results, and giving managers and their employees the kind of feedback they need for improving their skills and to give the company more of what it needs. With passion, humor, and a rare insight into what motivates all of us to do our best, Culbert offers all of us a chance to be better managers, better employees and, indeed, better people. Culbert has long said his goal is to make the world of work fit for human consumption. “Get Rid of the Performance Review!” shows us how to do just that. How Much Do You Hate Performance Reviews? Questions to Make You Think Twice About Performance Reviews.